Samsung Galaxy Grand vs Samsung Galaxy Mega 5.8 are the new large sized smartphones from Samsung. Samsung has been constantly increasing the size of their smartphones starting from Samsung Galaxy S and now it has come to Samsung Galaxy Mega 5.8 inch. 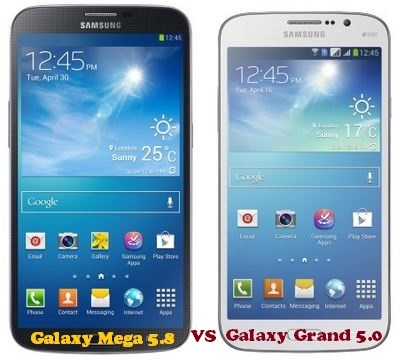 Here we are comparing Galaxy Grand which is 5 inches and Galaxy Mega which is 5.8 inches the resolution in mega is better compared to Grand with 960×540 pixels having a similar camera and operating system, Mega has a similar Dual Core processor with 1.4 GHz processor compared to the Grands 1.2 GHz processor. In relation to its size Mega also has a 1.5 GB ram which is better than Grand and S III as well where both have a 1 GB ram at offer. The rest of the features remain to be same as Grand. Dual Sim No Yes, GSM+GSM and Dual Standby.